I've been feeling a little uninspired with the blog lately--hence no post Friday and Monday. And actually maybe that's not entirely fair. I was busy Friday and had a migraine, and yesterday I did feel uninspired--and like a slug. 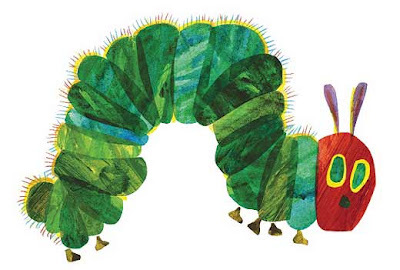 It kept making me think of The Very Hungry Caterpillar, and I was going to post just to say I miss that book, and Goodnight Moon, and The Giving Tree, and Where the Wild Things are, and Cloudy with a Chance of Meatballs, but I was too much of a slug to even do that. I was in the middle of Gristedes Mega Store on 26th street today, the most unaesthetic building, with the most unflattering lighting, in the most creatively vapid part of town, and suddenly I knew what gets me going. Color. Always. It is the starting point for almost every creative decision we make--what we wear, our interiors, events we throw, the list goes on and on. My mood is often dependent on the color of the sky, my eye drawn to things based only on their richness and tone. Color theory was my favorite class at Bates. It can take me over 5 minutes to pick out nail polish in a salon (while the manicurist taps her toes--plus I usually sit down with two and tell her Ill decide by the time she gets to it), and even wrote an job cover letter saying if I were a brand it would be OPI nail polish. These are not coincidences my friends. I don't think I'm unique in my love of color, but perhaps my recognition of it--you might be drawn to room of someone's house, or a christmas tree ornament and not register why. You might think your white bedroom lacks personality but never assume it's because your walls could use a warm coat of paint. But every meal placed infront of us, and advertisement we flip by uses color to its advantage. I like everything with color--maybe only in photographs do I truly love Black + White. Even there, it is a lack of color that makes lines and details pop--never without relation to color. In addition, it is so often little found still lifes that are the best combinations of color. Combinations that would be a perfect jumping off point for a dinner party, living room, or outfit. I realized this standing in the middle of Gristedes because I was stopped by a very haphazard, down run boring display of spices. holes in the line up, bottles pushed every which way, and horrid price tags and barcodes everywhere (again, shrouded by the ugliest light). 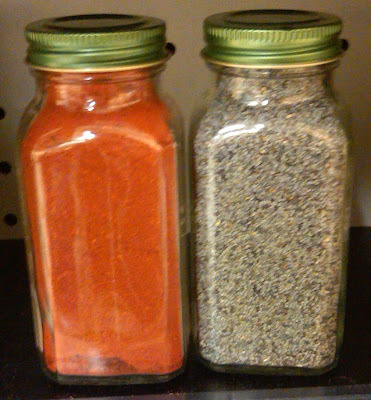 And still somehow, I couldn't get enough of Paprika and this purpley black pepper sitting next to each other. Below is the picture.Close pantone matches on the fashion and home color grid might be Spicy Orange (18-1445) and Mulled Grape (18-3714). Who knows, they may be the basis of the next table you set.